There are 3 types of woodworm commonly found in Ireland, the Common Furniture Beetle, the House Longhorn Beetle and the Death Watch Beetle. Damage by the furniture beetle is identifiable by a peppering of tiny holes in the surface of the wood. These holes are in fact emergence holes, meaning that the adult beetle has emerged from and left the timber after spending its time tunnelling through it as a grub. 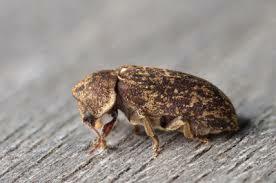 The furniture beetle is the most common cause of woodworm damage. This beetle attacks softwood species of timber leaving 1-2mm exit holes. It prefers damp, rather than dry wood and the grub will head for, and stays in, plywood for longer than any other timber. Damp floorboards, damp loft timbers and old furniture where the polished finish has worn off, (the furniture beetle prefers unfinished wood like old floorboards and loft rafters) are good targets for the beetle. 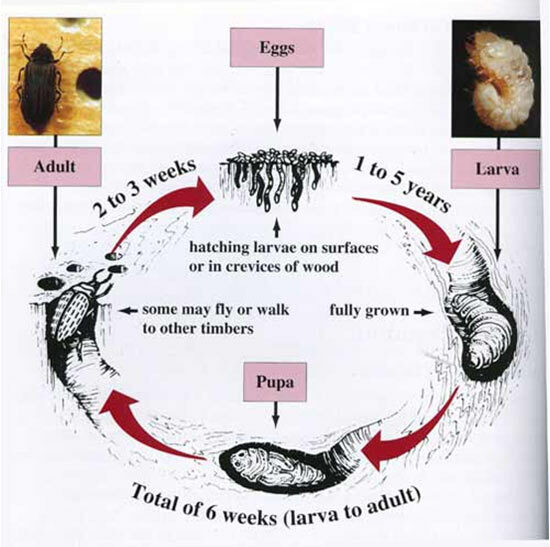 The beetle lays its eggs on the timber and the grubs do the damage. With ‘active’ woodworm you will find a scattering of tiny dust piles on the timber. This dust is called ‘frass’. Structural weakening is rare with the furniture beetle, except in timbers whose cross section is small and there is a lot of damp. The House Longhorn Beetle is principally found in roof timbers, where it attacks the sapwood of exclusively softwood species, often resulting in severe structural weakness. The holes and tunnels of this beetle are significantly larger than the furniture beetle. 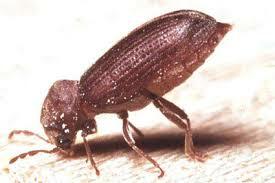 The Death Watch Beetle is common throughout the South of Ireland. 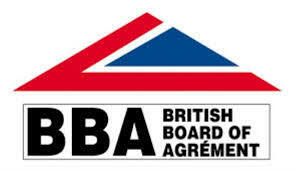 Northern parts are less affected, mainly where timbers have been imported, particularly Oak from France. 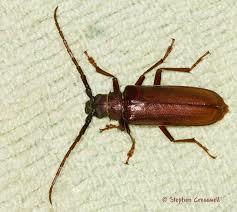 This beetle attacks large hardwood timbers, such as Elm and Oak. The beetle, having started in hardwoods like these can move across to neighbouring softwoods. This beetle much prefers very damp conditions especially where there is some kind of fungal decay or “wet rot” in the timbers. The beetle needs these conditions to develop rapidly. Treatment is more difficult than for Common Furniture Beetle, partly because of the 10 year life cycle and partly because severe structural damage can be caused to even large section timbers.